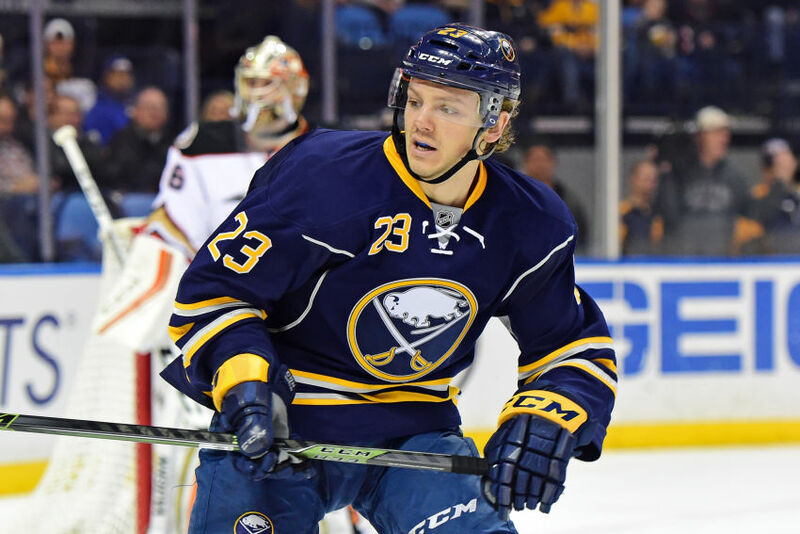 BUFFALO – The improvements, Sabres coach Dan Bylsma said, have been “drastic.” In a matter of months, winger Sam Reinhart has transformed himself from a raw prospect into a first-line NHL talent. Reinhart, of course, possessed supreme hockey intelligence when the Sabres drafted him second overall in 2014. Now, the rookie, 20, has developed the physical tools to compliment his strong mind. “You have to give him a lot of credit for his diligent work,” Bylsma said Sunday inside HarborCenter following the Sabres’ last practice before a five-day Christmas break. Reinhart, who said he’s spent at least an extra 20 hours on the ice honing his skills, is by far the Sabres’ most improved player this season. In 34 games, he has eight goals – as many as Marcus Foligno, Zemgus Girgensons and Matt Moulson have combined – and 15 points. Reinhart has four goals and eight points in the last 11 contests. Remember, Reinhart mustered only one assist during an unimpressive nine-game NHL trial last year. Rookie center Jack Eichel, the second overall pick in June, has received most of the attention this season. But where would the Sabres, who have only 14 wins and 32 points, be without Reinhart? It’s easy to forget now, but Reinhart was arguably the Sabres’ biggest question mark in training camp. Sure, general manager Tim Murray said months earlier they expected he would make the big club. But what else was he supposed to say? The Sabres had the option to send him to the minors. Thanks to an impressive preseason, Reinhart never let them. That means Reinhart – whose shot has morphed from a “muffin” into something “lethal,” Bylsma said – plays at a faster pace and has a greater intensity on the puck. Earlier in the season, Bylsma said, Reinhart wouldn’t even get to the puck. That top line comprises Reinhart, center Ryan O’Reilly and Jamie McGinn. Clearly, O’Reilly, who also processes the game quickly, shares a special chemistry with Reinhart. Reinhart displayed those unique skills late Saturday afternoon in the Sabres’ 3-2 shootout loss to Chicago. With the game tied at 1, O’Reilly fed the puck from the left corner along the boards to Reinhart behind the net. Reinhart grabbed the pass, drifted back past the right post and fed O’Reilly from down low as he skated to the bottom of the left circle. But how long will Reinhart and O’Reilly stay together? The Sabres shifted Reinhart from center to the wing this season so he could skate on the Sabres’ top two lines. Bylsma recently told Reinhart he could move back and forth between center and the wing.